For entrepreneurs and small business owners, the holidays are the busiest – and most stressful – time of the year. If the holiday season does not impact your business directly, as a business owner the holidays will affect you personally. And that affects your business. Family schedules change, there are seasonal events and special occasions you need to attend, gifts to buy. Your employees may need extra time off for personal reasons. Thanksgiving. Black Friday. Small Business Saturday. Cyber Monday. Giving Tuesday. Green Monday. Free Shipping Day. Hanukka. Christmas Eve. Christmas. Boxing Day. Kwanzaa. New Year’s Eve. New Year’s Day. Even if you’re normally an organized person, now is the time to go into organization overdrive. If you normally have a good memory, during the holidays it’s easy to get overwhelmed and forget to do some important and basic tasks. Whether you use a calendar, a checklist, or an app on your phone, or just a notebook and pen, write it down. Whether you run a 1 person business or have a team of dozens around the globe, the busy holiday season is your opportunity to get some help. Whether you hire full or part-time staff, recruit a virtual assistant our outsource projects to a freelancer or agency, delegate. The holidays are the perfect storm: everything needs to be done perfectly and immediately, both at work and at home. Last minute demands, shipment issues, technology failures. This year, cut back on the holiday party or eliminate it all together and give employees a check instead. Schedule downtime with your family. Control your expectations. Prioritize what is important, and for everything else, simplify. 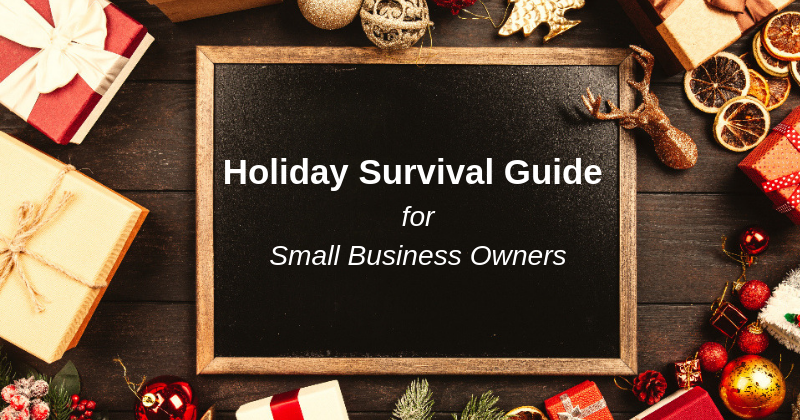 For many small business owners, the holidays are the busiest time of the year. Here are some holiday survival tips to help small business owners maximize profits and minimize stress.